DAVIE, Florida -- Nearly 800 people are registered and ready to compete to see who can bring in the longest and the most Burmese pythons from designated public lands in south Florida, the Florida Fish and Wildlife Conservation Commission (FWC) announced today at the 2013 Python Challenge™ Kickoff in Davie, Florida. For competitors, the challenge is to harvest the well-camouflaged Burmese python, which can grow to more than 17 feet in the wild in Florida, with the chance of winning prizes of up to $1,500. Registrants are coming from more than 30 other states. They will have from 1 p.m. today through midnight on Sunday, Feb. 10 to find these nonvenomous constrictors. For the FWC, the primary goals of the Python Challenge™ are to raise public awareness and increase the agency’s knowledge base regarding this invasive species and how to better understand and address impacts on the Everglades ecosystem, including native wildlife. “The 2013 Python Challenge™ is an unprecedented effort to focus public interest, support and direct involvement to help deal with Burmese pythons,” said FWC Chairman Kenneth Wright at the kickoff news conference. “The FWC is pleased that so many people are joining this earnest effort to limit the impact of this invasive species on Florida’s diverse native wildlife. Floridians and people from all across the United States truly care about the Florida Everglades, and they are clearly eager to help us better understand and solve this problem,” Wright added. FWC officials today welcomed competitors and the public to the 2013 Python Challenge™ Kickoff at the University of Florida Fort Lauderdale Research and Education Center, which is in Davie. People attending the kickoff had the chance to get a close-up look at captive Burmese pythons, learn from experts how to identify these snakes and witness demonstrations of python-handling techniques. UF held its annual open house featuring work by faculty and students addressing invasive species in Florida. The kickoff is the first of two public awareness events. The Python Challenge™ concludes with an Awareness and Awards Event on Saturday, Feb. 16 from 10 a.m. to 4 p.m. at Zoo Miami. There are two separate Python Challenge™ competitions: the General Competition for the public and the Python Permit Holders Competition for people who have permits from the FWC and other agencies to regularly harvest these snakes. Both groups will be collecting data. 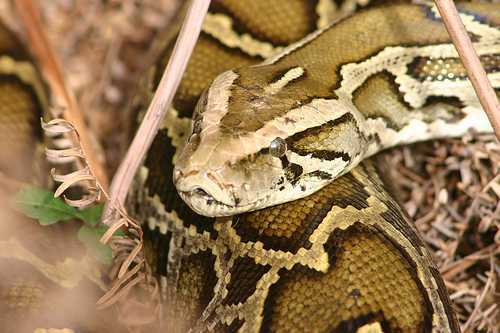 When dropping off a harvested Burmese python, participants must submit data sheets providing information such as the snake’s size, GPS location and habitat where it was found. Grand prizes of $1,500 for harvesting the most Burmese pythons will be awarded to winners of both the General Competition and the Python Permit Holders Competition, with an additional $1,000 prize for the longest Burmese python harvested overall. Funding for the prizes is provided by sponsors and through registration fees. People can sign up for the Python Challenge™ at any time during the Jan. 12 to Feb. 10 competition, even on the final day. Go to PythonChallenge.org for the required online training, official rules and registration, as well as information on the public events. The key sponsors of the 2013 Python Challenge™ are the Felburn Foundation and Flowers Foundation. Many partners, including the University of Florida, The Nature Conservancy, The Future of Hunting in Florida, the Wildlife Foundation of Florida and Zoo Miami, are providing important support for the Python Challenge™. The FWC’s partner agencies have also played a critical role in these efforts; they include South Florida Water Management District, Everglades National Park and Big Cypress National Preserve. Reporting sightings of exotic species to IveGot1.org, 888-IVEGOT1 (888-483-4861) or by using the free smart phone app IVEGOT1 for iPhone and Android. It’s helpful if you can submit a photo and location. Not releasing an exotic pet into the wild, and reminding others of the dangers of releasing nonnative species. Additional information about the 2013 Python Challenge™ can be found at PythonChallenge.org.